Following the success of the Weimaraner, Gundog, Toller, Aussies Worker and Papillon Agility Leagues, Lurcher enthusiasts are backing a new league exclusively for all types of Lurchers (i.e. Sighthounds X with other Non-Sight hounds and Longdogs (ighthounds X Sighthounds.) 'Lurchery' type dogs including Sighthound Crosses and all pedigree Sighthound breeds such as Italian Greyhounds will be allowed though a photograph of the dog might be required. Well done to All LL2 members. You've all worked hard and made good progress with your furry friends. Last year some of us had the chance to learn at the Lurcher Training Days with Ray Ellerton. In previous years, Ray competed with Razz the Lurcher and Slipper the Whippet. 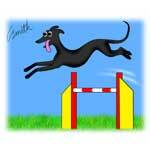 He currently has young Lurchers in training which have been bred from wife Amanda's Grade 7 Lurcher, Bella. Ray helped us with motivation, contacts and tightening turns to name but a few. We hope to have some more of these training days as, after speaking to the handlers, they all enjoyed themselves and went home with inspiration from what they had learnt. Thanks to Ray. Not awarded because everyone has won out! If those above could contact us and confirm their current address then their prizes can be posted out, or arrangements can be made to collect from a show? Wishing you all good luck in 2012. A word to the winners from Paula and Alex Trigg, 'We are proud of all the handlers who have taken part in Lurcher League 2. Some of the Lurchers have needed a lot of patience and understanding from their handler and this has paid off as they start to make good progress, first with what had seemed like an elusive Clear Round and then onto Placed Rosettes! It's been nice to hear Lurcher League 2 handlers have met up at shows and supported each other too. Our Winners and Runners Up worked very hard with some moving up more than one grade last year, so a special Well done to them! Thanks for your support, and good luck to all the Lurchers in 2011. The overall 2010 Champion Lurcher is Evelyne Thomas with Honeybeech Shepard Moon (G6) with 1467 points. Lurcher League 2 encourages handlers with a training/motivation ideas and gives them a chance to get to know other people with similar dogs. It's moved on a bit now with some handlers entering Lurcher Pairs/Teams together or just meeting up at shows for a chat and progress reports giving them a chance to compare their results against others. It just shows that with patience and determination you can achieve your dreams. Keep up the good work and hope to see you at a show soon.